The MESSY GATE is in, it has just been galvanised so is a wee bit shiny but will dull to a perfect grey once it has weathered a bit. Small Frog Dogs are now safe in their garden when there are visitors. 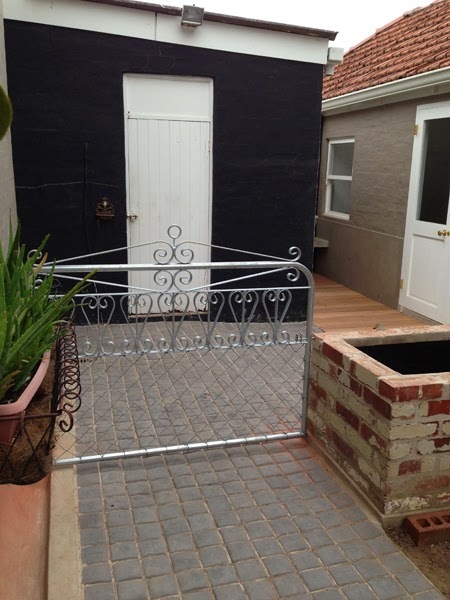 Thank you CUSTOM MADE WROUGHT IRON. 'Twould take too long to dull for me. Once it's been galvanised it's easy to paint it black - it's what I did to mine (and it would sooooooooo work with that lovely wrought-iron(?) border you have).